Collaborations and (unexpected) crowd surfing seemed to be a common theme at Wednesday night’s sold out (Sandy) Alex G concert at Bottom Lounge. Kicking things off, Brooklyn based CENDE got the early crowd warmed up. Towards the tail end of their set, they brought out Michelle Zauner of Japanese Breakfast for the first cross-lineup collaboration of the evening. After CENDE left the stage, the room continued to fill in as Zauner and her band quickly set up for their own set. When 7:30 struck, an undeniable wave of energy swept through the room during the first notes of Japanese Breakfast’s introductory song. The crowd remained attentive and supportive as the band moved through their performance of old favorites and new tunes taken from the upcoming album Soft Sounds From Another Planet, out July 14th on Dead Oceans. Zauner introduced one of the new ones, “Road Head,” about halfway through the set, which got the crowd cheering and intrigued by the title. Zauner also set the scene for Japanese Breakfast’s latest single “Boyish”, telling the crowd to imagine you were at prom with a disco ball illuminating the room, and your crush makes a beeline for you...only to pick the person next you. During this friend-zone anthem, Zauner’s dreamy vocals rang out, her blunt and relatable lyrics echoing through the venue. The mellow mood picked back up with the viral song “Everybody Wants To Love You,” with the crowd screaming along to the call-and-response style chorus and moshing. As Zauner gave a shout out to CENDE and (Sandy) Alex G for being the best tour mates before leaving the stage, the crowd displayed an unwavering display of appreciation for Zauner’s heartfelt narratives and easygoing stage presence. Lightening things up and taking the energy to another level, (Sandy) Alex G and his band took the stage to “Life is a Highway” around 8:30PM, and the crowd packed in even closer to the stage. “Judge” from the new album Rocket led the formal setlist of the evening, with Giannascoli (the full name behind ‘G’) starting off standing center stage with his guitar. The violinist of the group joined Giannascoli in his center-stage spot during the third song of the evening “Bobby,” which he released as a co-lead single with “Witch” back in March. Shortly after performing both of these debut singles from Rocket, Giannascoli moved over to the keyboard posted up next to his mic stand to perform a few tracks from his 2015 album Beach Music, like "Bug" and "Kicker." As the set progressed, the energy of the crowd only amplified, with Giannascoli hopping down from the stage at one point to join his fans in the pit, and some of the audience crowd surfing. Although he has diverse sonic range that goes everywhere from lo-fi to country, an Alex G concert is one of the last shows you’d expect to see crowd surfers. The performance drafted such an electric energy that it didn't exactly feel out of place, though. At just about 9:30, Giannascoli and his bandmates left the stage, part one of the set drawing to a close. 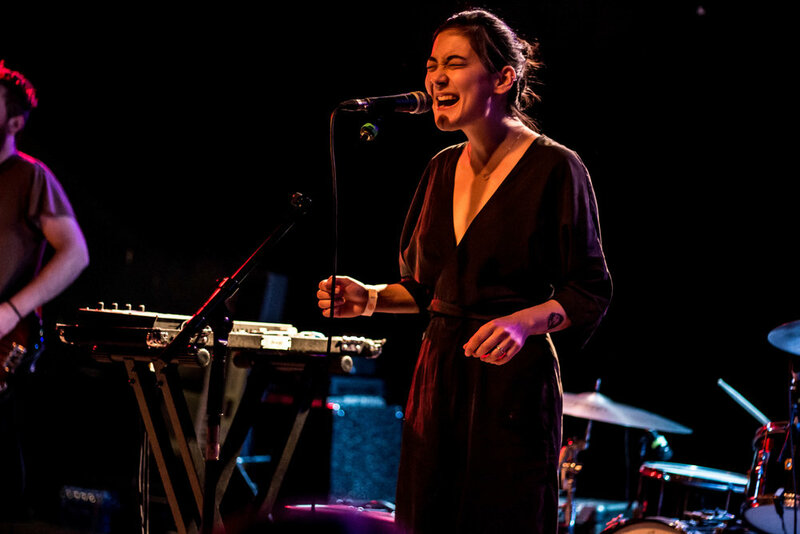 The group soon returned for a request-based encore, including crowd favorite “Brite Boy,” which guest starred Zauner of Japanese Breakfast again. The fact that the group is able to take requests and keep the setlist fresh for each show displays their raw talent and steep musicianship. To ensure you don’t miss out on your own unique (Sandy) Alex G set, spiked with collaborations from the equally brilliant Japanese Breakfast and CENDE, head here to get tickets to the remainder of the tour! To hold you over until these bands make their return to Chicago, check out the photo galleries below.